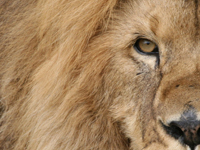 Animal Defenders International : Conservation & Wildlife : Today their victim has a name: Cecil. Do we want a world where torture and killing of beautiful animals is sold for entertainment? The cruel murder of Cecil, the majestic lion from Zimbabwe has hit the world’s media and exposed the psychotic US dentist who describes his “love” for killing beautiful animals. Cecil was part of a scientific study, was tolerant of humans and a favourite with visitors to the national park. Cecil was illegally lured from the park and killed in the most brutal and sadistic way – injured with a bow and arrow, he reportedly suffered for 40 hours before they shot him. Not only has Minnesota dentist Walter Palmer killed Cecil, but wiped out a generation of his cubs, as other males will move in and kill the cubs so that the females will be ready to breed again. Palmer said: “I had no idea that the lion I took was a known local favourite, was collared and part of a study.” It is probably his only regret. Yet every animal he has killed has such a story, mother, father, sibling, a vital part of this planet we all share. Surely it is time our world was no longer up for grabs to the highest bidder? If humans are to evolve and progress, we must end the abuse and suffering of animals in the name of entertainment.